One of the best talks I have heard about writing a book is actually about what not to do. Campbell, who was honored with the Library of Virginia People’s Choice Award for nonfiction, highlights three areas that she did wrong when writing her book. Those areas include: payment, procrastination and publicity. “You’re not going to get rich writing books,” Campbell notes. She was prepared for that. What she wasn’t prepared for was making negative dollars. Once she factored in her time and expenses, she says, she made no money. Her first lesson she shared is to negotiate to have expenses covered. Her contract did not include expenses, so Campbell paid for gas, hotels, meals and photocopies incurred as she researched the book and later when she went to book signings. Procrastination is always a challenge. One way Campbell avoided working on her book was raking all the leaves in her “very large yard.” She also confessed to arranging her work space several times. She finally developed some rituals to place her in the writing groove. She learned to break her work into small chunks and focus on one chunk at a time. Campbell says it’s also important to ask how much publicity the publisher will do and how much you as the author will have to do. She had to do most of her own, although she did suggest to her publisher where to send review copies of the book. She scheduled speaking engagements and created her own press kits by taking pocket folders and inserting her business card and several pages from the book to send to bookstores to make them aware of her book. If you want to learn how not to write a book simply ask an author who has gone through the process. 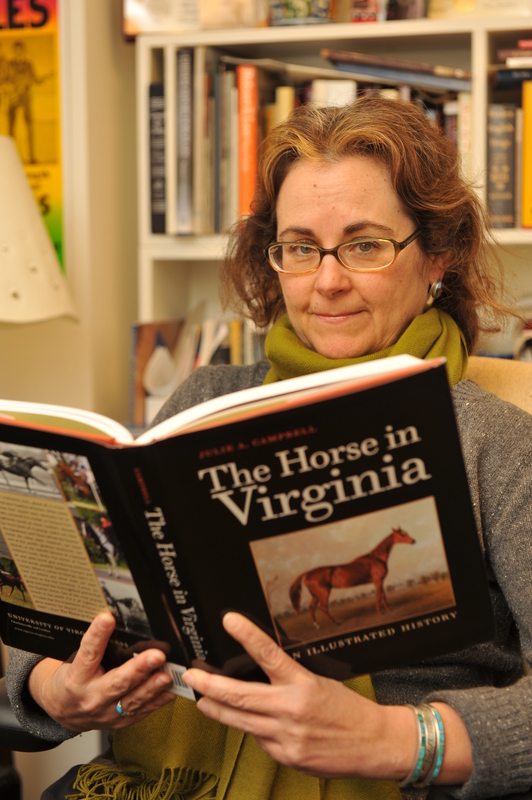 Julie Campbell, who wrote The Horse in Virginia: An Illustrated History, shared what she learned as the result of her research and writing at the 2013 NFPW Conference in Salt Lake City. For her it comes down to three areas of focus – payment, procrastination and publicity. Her contract did not include expenses, so Julie paid for gas, hotels, meals and photocopies incurred as she researched the book and later when she went to book signings. “I would negotiate my expenses if I had another project,” she said. “Next time, I will get an agent,” she said. Another thing Julie would pay closer attention to is how many advance copies of the book she would receive. Her contract only called for her to receive two copies of the book. Procrastination Ten years past from the day Julie signed the contract until the book was published. “Life just gets in the way some times,” she noted. For her life included a job change, a move, a broken knee and sometimes feeling overwhelmed by the project. Until then, she spent time purchasing office supplies and organizing her work space. She noted it’s important to ask how much PR the publisher will do and how much you as the author will have to do. Julie suggested to her publisher where to send review copies. Julie also credits NFPW seminars she attended with providing her with some good tips to generate her own PR. One suggestion she picked up was to take pocket folders and insert her business card and several pages from the book to send to bookstores to make them aware of her book. Julie also created a Facebook page for the book. One day my book will be finished and it will be archived at the Library of Virginia. Until that day, I live vicariously through my author friends (author, as in published book; not writer, as in still working on one). The best way for me to do that is at the annual Library of Virginia Literary Awards. As in years past, Adriana Trigiani hosted the evening. Herself a gifted and prolific writer, she always provides plenty of laughter and nuggets throughout the evening. This year was no exception. She related a story about writers. Seriously, I couldn’t write it better than that. And the evening is about being seen. Even Adriana admits to falling prey to it, describing David Baldacci, who presented the Emyl Jenkins Sexton Fiction Award, as “eye candy.” In talking with him about it later, he just laughed and rolled his eyes. I’ve always enjoyed his books, but as an aspiring author, I appreciate the time he has always given to writers. The award he presented is always bittersweet as I remember my dear friend Emyl Jenkins. She continues to sprinkle fairy dust on me from afar, and for that I always will be grateful. The highlight this year for me was watching my friend Julie Campbell win the People’s Choice Award for Nonfiction for her book The Horse in Virginia. For many in the audience, the highlight was watching Earl Hamner receive the Literary Lifetime Achievement Award, which was presented by John-Boy Walton himself, Richard Thomas. As Hamner spoke, I was taken back to my childhood days, watching The Waltons with my family. At the beginning and ending of each episode, we heard Hamner speak and wrap up the episode, usually with a philosophical thought. Until next year’s Library of Virginia event, good night John-Boy. When it comes to publishing a book, it’s a new horse race. That according to Leeanne Ladin, who recently co-authored “Secretariat’s Meadow: The Land, The Family, The Legend,” which she wrote with Kate Chenery Tweedy, whose mother owned champion racehorse Secretariat. “Publishers want a marketing plan before they want a manuscript,” she said during a recent talk. Many authors aren’t sure where to get started. Another author friend isn’t current with all of the social media platforms and has asked for guidance. I’m happy to help, but I can only do so much because of how much time is required. For independent publicists, it’s an ideal niche, says Patsy Arnett, who is president of Richmond-based Arnett & Associates, an international speakers bureau. What are you doing to get your book publicity?